This week we finished our tour of the peninsula of Korea. I found several other websites to visit this week with the girls. This week we focused more on South Korea. We are still reading aloud the book Archer's Quest by Linda Sue Park (and I'm even interested to see how this is going to turn out!). Laurianna has continued reading Seesaw Girl by Linda Sue Park and McKenna LOVES the book Dear Juno by Soyung Pak. 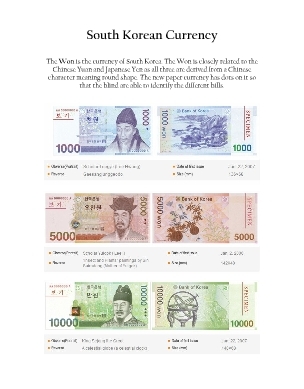 Here is the document with the South Korean currency: Next week we will be starting a three week study of Japan ... and I so need to get working on those lesson plans. I've started researching some things, but haven't sat down long enough to put it all down (that's usually my Friday afternoon and Sunday evening routine). I'm so impressed with South Korean unit! Would it be ok to link to you off of my site? We have some many friends with Korean children I know they would love all of your info!